Wearing nothing but a bikini and armed with suntan lotion and peroxide, this beach beauty turns heads whenever she steps onto the sand. Unveiling the latest in two-piece fashion, this smiling summer standby is a real crowdpleaser. 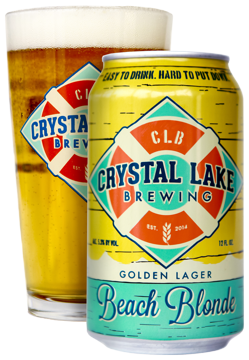 The Beach Blonde is our lightest offering. In the glass, it glows golden like the sun and supports a creamy white head. The finest imported malts produce a slightly bready character with a touch of honey-like sweetness, while noble hops provide a clean, crisp, spicy finish. A true blonde that is easy on the eyes - and the palate. Gazing over the bow, this American icon expertly weaves his way through the clear, calm waters of Crystal Lake. Whether he's pulling weekend waterskiers or just pulling rank on a pleasure cruise, this skipper leaves all other boats behind with a wink and a wave. Here’s to the cursed captain. Testing the depths of karma, luck, and even the lake itself, this unlucky boater slips in and out of the shallows worry-free, never seeing the submerged rock or stump that leaves him returning to the pier slower — but a little wiser — than when he left. 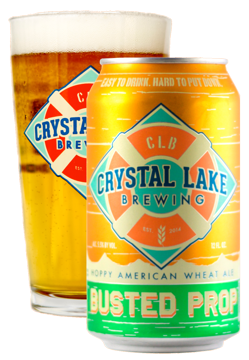 You'd be wise to pick up CLB's Busted Prop, a hoppy American wheat ale that greets you with the aroma of tropical fruit and spice. A big, bright citrus taste follows, balanced by a wheaty smoothness. With a clean, hoppy finish, you’ll want to raise another — along with the trim. All hail the Slalom King. 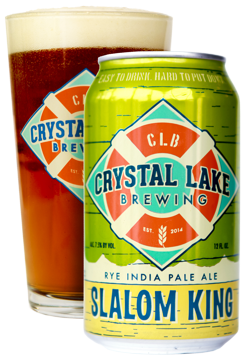 Casually dropping to one ski, expertly cutting in and out of the wake, and all the while trailing his signature cascade like a robe to announce his royal presence, this Crystal Lake staple draws praise on the water and a crowd on the sand. This is a huge beer, starting with the aromatic explosion. A sip reveals tons of citrus hop flavor along with floral characteristics. 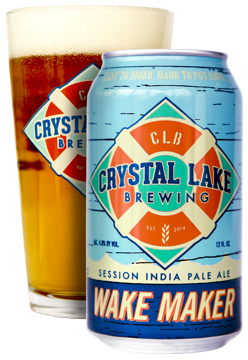 A firm malt sweetness with a hint of rye spice appears quickly, then gives way to an intense hop bitterness. This beer isn't about perfect balance, it's about hops, hops and more hops. One sip and you will feel like royalty. Reaching for an elusive bobber, balancing ever-so-dangerously on the edge of the boat, she hits the water with a SPLASH heard clear across Crystal Lake. While gravity wins, the loser hears the tale retold with every visit to the bait shop. Did we go overboard with our Oatmeal Stout? You can be the judge of that. Rich aromas of expresso and dark chocolate hang in the air, while flavors teeter between coffee, chocolate, sweet caramel and hints of dark fruit. This is a big, full- bodied ale, dark and decadent, and one that you'll find yourself falling hard for. Every once in a while, we take a break from the lake. 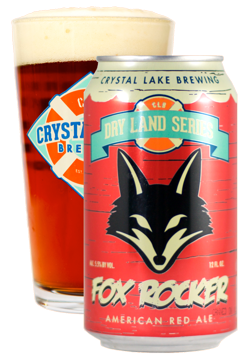 This first beer in our Dry Land Series is the result of a partnership with 103.9 The Fox, our favorite rock radio station in Chicagoland. Like us, they're independently owned, local, and embrace a loyal following. When you drink local, we give local. For every Fox Rocker case and keg sold, CLB is donating part of the profits to 1Pet 1Vet, a terrific local organization that provides trained service dogs to be companions for our veterans.